According to its organizer, Mr Utsav Chaudhary, its Bipul’s and the band’s first ever US tour after successfully touring London, Melbourne, Sydney, Hong Kong, Dubai, Nepal and India. 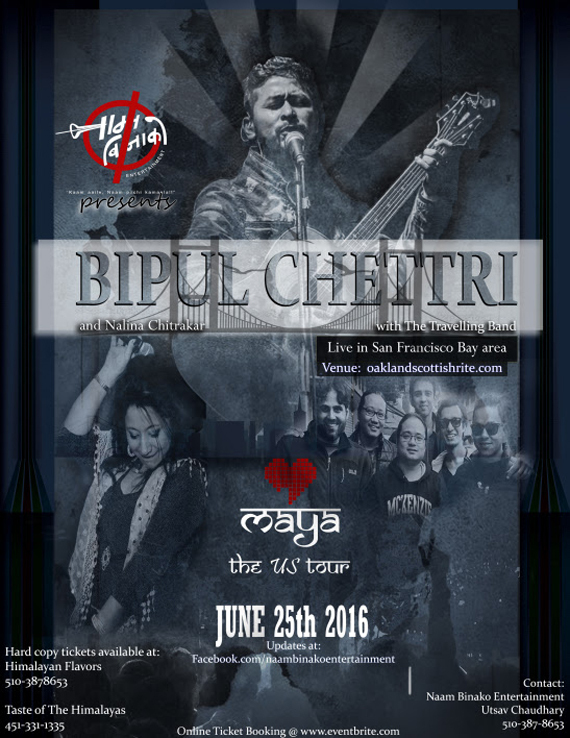 They are excited to bring Bipul Chettri, one of the most popular musicians amongst the Nepalese-speaking populace of the world. We are excited and overwhelmed from the positive response we have received from the community living in the Greater Bay area and the US as a whole. We have been selling tickets online, but since there has been a great demand for offline tickets as well; we are distributing physical tickets to various locations of the Bay area and beyond. We are positive that this will be a great concert as we are featuring one of the most versatile and talented personalities who is not only a singer, but a guitarist, songwriter, arranger, producer, composer and a music teacher as well. These are the qualities that distinguish him from most other artistes. Bipul Chettri has successfully managed to blend contemporary sounds to Himalayan mountain folk music. His debut album, ‘Sketches of Darjeeling’ hit the market in 2014 and spread across the world like wildfire. This album became a top seller within 48 hours of its release on one of the biggest indie retail site in India while making him the Highest Selling Artiste on that portal for the year 2014-15, a feat very rare for a Nepali language album. His unique compositions draw all kinds of crowds, from youngsters to adults, as his music not only breaks the generation gap but also the physical boundaries. He is from Kalimpong, a major educational town of Darjeeling where he studied and practiced music since childhood. His music reeks of the sounds of the hills and the mountains. Maya, the US Tour 2016 is based on his next album called ‘Maya’. It gives our team immense pleasure to see such a positive response writes Naam Binako team on their Facebook page and is doing their level best to make it one of the most successful events to pave the way to host other great singers and bands in the future. According to the organizer, the event starts at the Cocktail lounge and a VIP reception with a drink, which then moves on to one of the most awaited concerts. The concert also features local artists, one of the most popular pop singer, Nalina Chitrakar. She is not only popular in Nepal but in the US as well, especially in the Bay area. She was named the country’s Best Pop singer in 1999 and 2005. She writes songs about the harmony between Madhesi and Pahadi people, She has toured Nepal, US and other countries as well. Naam Bina Ko Entertainment’s, under the Chaudhary Group USA, main goal is to entertain an individual through different ideas ranging from concerts, movie, drama, dance and DJs. Their main aim is to bring joy to every single person attending their event. According to the organizer, this concert is a strictly entertainment night, so no speeches and other ceremonies usually associated with most of the events here. Naam Bina Ko Entertainment, aka, Nameless Entertainment’s motto is ‘Kaam Aaile, Naam Pachhi Kamaula’ which literally translates to ‘Work First, Fame Later’. Let’s see how far they will go to achieve their name and fame in this industry.